Continuing with my random editions of “So-And-So is Awesome,” today I tell you that Jorge Garcia is awesome. But you probably knew that already. A few months ago, while browsing Mr. Garcia’s blog, I noticed he accepts fan mail, and–quite graciously I might add–sends out autographed photos to those who request it. Being the peculiar fellow I am (and a fan of Garcia’s work), I decided to not only send him a letter, but also a copy of my novel. If that wasn’t strange enough, I thought I’d take the whole thing a little farther into Bizarro World, and I even signed the novel to Mr. Garcia. Yes, that’s right: I autographed my novel and sent it to a famous person. In case you can’t read it, the inscription reads, “To Anthony– Thanks for the book. 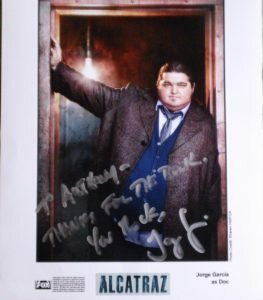 You rock, Jorge Garcia.” That’s right, he did in fact get the novel! And that’s pretty awesome. Next time, we discuss why October is awesome, and why candy corn is absolutely not. NOTE: For anyone not counting, this post includes six instances of the word “awesome,” (including the title and this note) which alone should get me kicked out of the HWA.